Near real-time data of ice floes in the Arctic region are being made available thanks to efforts by scientists at Ørsted DTU (Technical University of Denmark) which is participating in a project called DAMOCLES sponsored by a European Commission. 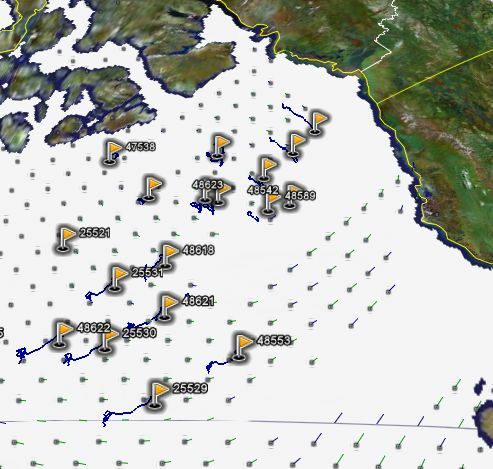 Project DAMOCLES is an integrated ice-atmosphere-ocean monitoring and forecasting system designed for observing, understanding and quantifying climate changes in the Arctic. The team at DTU have had a Java application for viewing the ice floes for some time, but recently released a Google Earth network link for looking at the ice floes and the data showing their movement. The data comes in part from the European Space Agency's environmental satellite called ENVISAT ASAR, and from devices attached to the ice which broadcast their position. Here is the web page describing the different data sets and the link to the Google Earth file. Very interesting data! The Antarctic Google Earth network link is even more interesting. Here they have included details on the overall development of ice in the Antarctic, details on the sea-ice conditions as well as iceberg locations, satellite photos of the ice, locations of drift buoys, locations of selected research vessels, and locations of a selection of more than 120 Antarctic research stations and bases. 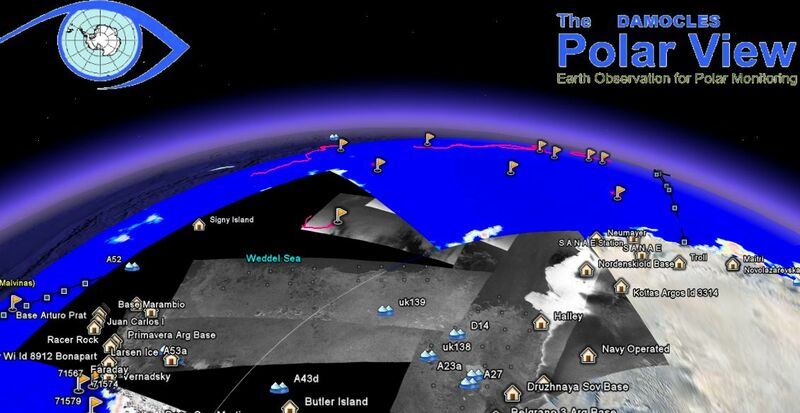 Full details are available from this web page, which is part of the International Polar View project. The application features large scale ice cover from the US/JAP AMSR-E instrument and a number of subsections of high resolution ENVISAT ASAR data from ESA. All data are updated regularly (the images several times per day when new images are available). Use the ENVISAT ASAR image of "Pacific Ocean West" to follow the disintegration of the B15a iceberg as well as the (I think) worlds largest iceberg C15a. Thanks to both Pierre-Philippe and Leif for contacting me with this interesting information. My apologies if I've described the projects incorrectly. These mutlinational projects can be complex to properly credit. Anyway, great work on the Google Earth network links!